The San Diego Padres had not had a good beginning to 1974. They had just been outscored 25-2 by the Dodgers in a season-opening three-game sweep in Los Angeles. Still, the opening night crowd of 39,083 at San Diego Stadium was primed and ready to cheer on their Padres, as they faced the visiting Houston Astros. After all, there was reason for optimism. 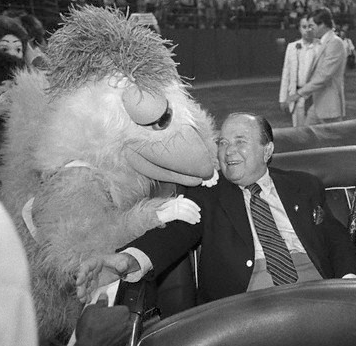 Tonight, April 9, was the first home game under the Padres’ new owner, Ray Kroc. Kroc had made his millions as the chairman of the board and majority stockholder of the McDonald’s hamburger chain. Born in 1902 in Oak Park, Illinois, he grew up rooting for the Cubs. When he was a travelling paper cup salesman, he attended the fourth game of the 1929 World Series at Shibe Park in Philadelphia, perhaps the most infamous game in Cub history. That day, the Athletics overcame an 8-0 Cub lead by scoring 10 runs in the seventh inning to eventually win 10-8.A Cub win would have tied the Series; instead, they lost the fifth game and the Series two days later. “I died,” Kroc remembered later. Kroc forked over $12 million cash for the team, a drop in the bucket for a man with a fortune estimated at over 40 times that amount. On this first home game of the season, however, the Padres wasted no time in proving their ineptitude. Starter Steve Arlin lasted only one full inning, leaving the game in the top of the second with runners on first and second and nobody out. He surrendered five runs, and reliever Ralph Garcia another, as the Astros bolted out to a 6-0 lead after two frames. Five more San Diego hurlers couldn’t stop the bleeding; by the time Houston’s Doug Rader grounded out to short to end the top of the eighth, the score was a lopsided 9-2. Ray Kroc, the brand-new owner, had already seen enough. Suddenly, a male streaker bolted onto the field, further angering Kroc. The crowd suddenly erupted in cheers, appreciative of Kroc’s candor. Not amused, however, were the ballplayers themselves, both the Padres and Astros. In the other clubhouse, Houston player rep Denis Menke said simply, “That was in bad taste.”8 Menke, in fact, would soon protest Kroc’s remarks to Marvin Miller, head of the players’ union. The Padres came up with three unearned runs in the bottom of the eighth, when Houston’s third baseman, Doug Rader, extended the inning with an error. But the Padres lost the game 9-5, going down meekly in the bottom of the ninth. Arlin took the loss for the Padres, and future Astro broadcaster and manager Larry Dierker earned the win. The Astros owed their success to three doubles: one from center fielder Cesar Cedeno, one from Rader, and one from catcher Johnny Edwards. Cedeno had four RBIs and first baseman Bob Watson two. Dierker scattered two runs and six hits, pitching seven strong innings for the win. Fred Scherman wrapped it up for Houston and was the victim of the three unearned runs. But all anybody wanted to talk about, both in San Diego and across the country, was Kroc’s tirade. The next day, he got on a plane and headed back to his home in Fort Lauderdale, Florida. Kroc maintained that he had planned the trip for weeks, but others believed he was merely trying to get out of town in order to lay low for a while. Whatever the case, Kroc soon found that escaping the consequences of his actions would prove to be difficult. He was eventually ordered by Baseball Commissioner Bowie Kuhn, echoed by Miller, to make a public apology to the Padres. 1 Phil Collier, “Padre Kroc Eats Humble Pie After ‘Stupid’ Slur,” The Sporting News, April 27, 1974. 2 Phil Collier, “Padres Get Break They Deserve, From Big Mac,” The Sporting News, February 9, 1974. 3 Collier, The Sporting News, April 27, 1974. 9 Jerome Holtzman, “Big Mac in Big Mess,” The Sporting News, April 27, 1974. 10 Melvin Durslag, “Too Many Misfit Owners,” The Sporting News, May 4, 1974. 11 Phil Collier, “Padres Hopes Spurred By Revival of Pitching,” The Sporting News, May 11, 1974.